And I, Ronald Sier, financial planner (and not even an amateur-psychologist), likes to call it left- and right brain. The left-brain is the rational, reflective, conscious side. It’s the part that deliberates and analyzes and looks into the future. While the right-brain is instinctive and emotional, always looking for instant gratification. 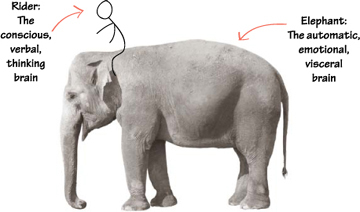 Most of us are all too familiar in which our own Elephants overpower our Rider. You have experienced it if you’ve ever slept in, overeaten, dialed up your ex at midnight, procrastinated, tried to quit smoking and failed, or skipped the gym. You also experienced it with your clients. You’ve experienced it when they didn’t follow up on your advice, procrastinated, wanted to buy stocks when prices are high, not saving for retirement and so on. 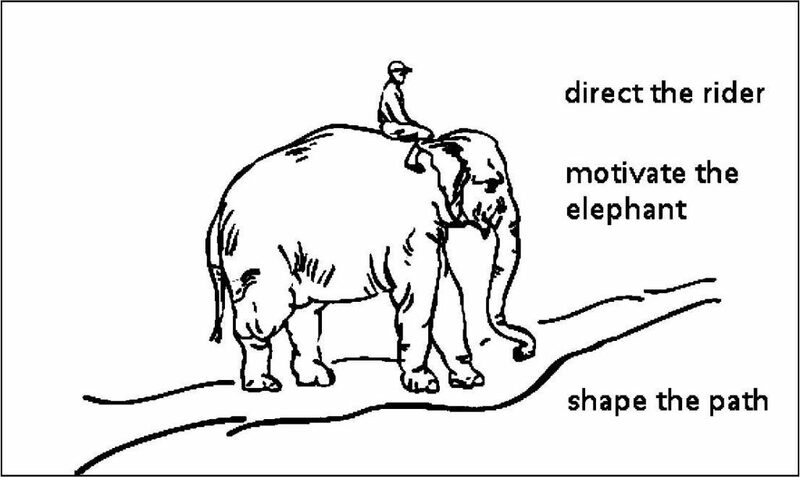 when you reach your client’s Rider but not the Elephant, your clients will have understanding without motivation, compassion or emotion. If you reach their Elephants but not their Riders, they’ll have passion without direction. It’s like climbing Mount Everest. Most mountain climbers’ goal is to reach the top. But what really satisfies them is the enjoyment and the challenge. But most of our clients’ situations don’t look like that, especially not with entrepreneurs. In most of their situations, their future is quite fuzzy. You have to present your clients with some evidence that makes them feel something. It might be a disturbing look at the problem or a hopeful glimpse of the solution. It has to be something that hits them at the emotional level. And It has to be something that speaks to the Elephant. Why? Because it turns out that – while negative emotions tend to have a “narrowing” effect on our thoughts, positive emotions are designed to broaden and build people’s repertoire of thoughts and actions. Joy, for example, makes people want to play. Play doesn’t have a script, it broadens the kinds of things we consider doing. And because joy encourages us to play, we are building resources and skills. Think about it. The positive emotion of pride, for example, experienced when we achieve a personal goal, broadens the kinds of tasks we contemplate for the future, encouraging us to pursue even bigger goals. There are several options. You might want to experiment by asking different kinds of questions to each and every client. But that can take a lot of time to figure out. Please, answer this question by leaving your comment – here below – and you’ll receive a free PDF with The Cheat Sheet to Motivate People to Follow Up on Your Advice Right Now. I like how you said that the ones who make a difference in your life are the ones who show they care. My brother has been wanting to save up money to get married. It may be beneficial for him to hire a financial planner. Financial Planning not only enables me to create ‘wealth’ for my clients, but more importantly create ‘wellbeing’ for them. I want to help people to seek independence so that they can could do whatever they wanted – which could also include becoming wealthier. The shared enjoyment of success with your clients. Peace of mind and a sense that their financial resources are helping them live their best lives are the two things I strive to convey to clients. Enabling families to continue their lives with as little financial interruption as possible during times of emotional turmoil due to loss or significant change. To help[ people make smart decisions about their money. To help people create a happy, peaceful, secure life where they get to do the things that matter most to them. To help clients make smart decisions around their money. 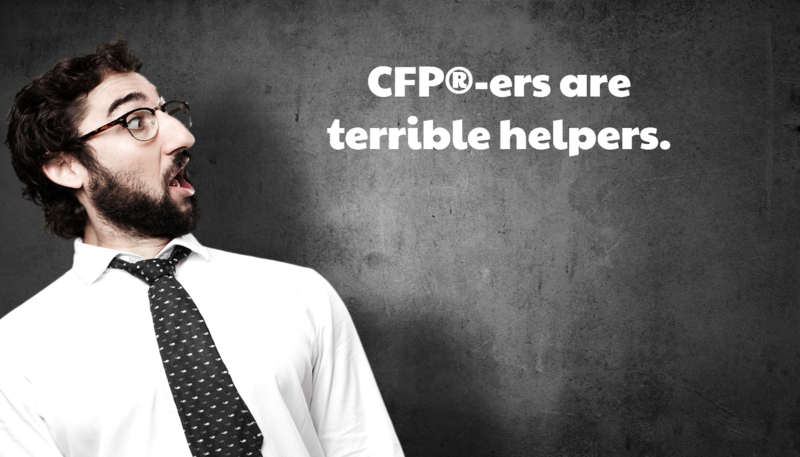 Clients know from the very first second, if you are open minded and clear like water in doing your job as a cfp. I want to help my clients enjoy their life. Not to worry about the future. I want to make sure that the people around me are much better off as they navigate through their journey called life. This is a career that if we were to do it properly, we can directly impacted countless people because of the work that we do. I feel great satisfaction and pride in inspiring others to get the most out of life with the money they have and celebrating each achievement with them, however small! I work for the betterment of others. As choice and perspective are individualistic meaning there is no perfect so assisting people to visualize the future on their own terms is my goal. Financial paperwork and institutions seem to make most people’s head pop off. I really enjoy explaining hat most view as difficult and confusing so clients feel like they can understand and make good decisions for themselves. To help people find the path to using the money they work hard for to have a great lifestyle now AND in the long term. I want to be an important and valued counselor in people’s live. To help clients understand the importance of financial planning . When you recieve that 9 o clock call about the death of your client and you are the conerstone in a very dark time. The feeling you get when you see that you have served your client in this time. To help clients see their dreams fulfilled by giving them objective advises. To help people slay their financial fire-breathing dragon fears, and find a real deep-breath kind of peace about their finances – finally put those back-of-the-head voices to rest, so they can sleep well at night and focus on the things that truly give their lives purpose. Make a difference in people\’s lives! To be a guide for our clients. To help motivate and protect them. To allow them to use our collective knowledge for their benefit and help reduce the behavioral mistakes they are prone to making. To be a trusted adviser and helping clients feel secure and peace about their money – to create a better life. My motivation is to provide financial education and understanding to my clients, then help them work towards making their financial and retirement goals a reality. My motivation is to help my clients understand that they have a financial future, how to take steps to achieve their financial futures and to actively know where we are working to get them. Hi Ronald, my motivation is to challenge people to see the real value of their money. Why do they have their financial goals, in stead of what are their financial goals. To help people achieve their dreams. What motivates me to be a financial planner? I\’m currently a bank teller (customer service rep), and I care for every adult and child that comes into our bank. I know that they all have needs, wishes, hopes, and dreams in their lives. I want them to share with me, so that I can help them take steps to fulfill what is meaningful and needed. I am a teacher, and a bit of a councillor…and now I realize that financial wealth is holistic (right brain & left brain.) I start my financial services rep training next week. Hooray! For me it\’s joy from possibility to be with interesting people and hepling them to be rich. To make a positive impact on people\’s lives. I am motivated to be a financial planner because I feel like I am in a position to feel confident and competent in my level of knowledge. It is a position where I can feel immediate self-value when I can reduces another person’s pain and discomfort. I know that sounds a little self-serving but I do like the feeling of helping others. Helping clients achieve everything that is important to them, financial and emotional. Helping our clients live their ideal life by ensuring they have the necessary financial resources. Helping people attain their goals and avoid being their own worst enemy. My mission is to help clients achieve wealth beyond possessions. To help clients navigate their financial lives and fulfill their goals. And especially helping them in their greatest hour of need, that is the most fulfilling. Early in my career I was motivated by some ego and perhaps even a little greed. But as the years have passed, things have changed and experience has mounted, I like to think I have evolved into something much more benevolent to clients and prospects, alike. I believe most planners have an altruistic gene that prompts them to do what they do – namely to help others. We all want to see our clients have success – both in terms of wealth and life events such as marriages, children, grandchildren, etc. But in today\’s rapidly changing world with its social media, 24/7 infotainment, regulatory changes and uncertainties, etc. I see my motivation as more of a sheepdog. Essentially, I am trying my best to protect my clients from the perils that can lay before them. Some of those perils are self-imposed like poor spending habits, lack of financial discipline or unrealistic market fears. But, honestly I\’m talking more about protecting them from the worst peril of all – unqualified financial advisors. You know the ones…the outstanding salesmen with limited knowledge or qualifications that will prey upon unsuspecting clients\’ emotional side (the elephant) simply for their own immediate financial gain. To continue with your analogy – the hunter who is simply looking to score the ivory tusks and leave the rest of elephant to rot. My motivation is to keep the elephant safe from those who would do him harm. Because helping people achieve success is immensely gratifying! Thank you for the article. A good read indeed. As for your question: I have always wanted to help people and this is a way of protecting individuals / their family in times of strife. What motivates me is the opportunity to provide my clients options because I believe options lead to financial security and freedom. Being at the centre of people\’s lives, helping them make the best decisions for them, not just financial ones either and giving them the confidence to follow through with it is an honour and privilege. Having them truly appreciate it is one of the best \’dividends\’ you can ever be paid. I\’m still fine tuning what motivates me. I know that most things in life are connected to money, generally people don\’t have a handle on their money, so it prevents them from forming or reaching goals and living out their values. I love to get people thinking about their life and what they want it to be like and help form a path for them to move that direction. What motivates me is help my clients to realise what can and can\’t be achieved with their money and to empower them to make the most of their lives (& those closest to them) and ideally live on purpose. I\’m motivated to help people achieve what they thought wasn\’t possible. I believe we have all been placed on this earth to impact people\’s lives, and I love the fact that financial planning is a route for me to do such a thing. It leaves me such great satisfaction when I can do what you described in this article! By providing my services so that my clients feel safe and cared for, I feel that I am making a real positive, and meaningful difference in their lives, which is truly rewarding. I am motivated by my clients\’ emotional responses to the work I do. Yes, I want to see every one of them have the financial freedom to choose what they want in life. But I am fundamentally motivated by their responses to me and my work, like asking what they would do without me when we navigate through a problem, or showing their joy when they realize that they really CAN retire early or stop working so hard next year. It\’s their joy, gratitude, empowerment, excitement and confidence that gets me up every morning. To help people find clarity and peace about the role of money in their lives, and helping them develop their plan to achieve their dreams. I’m motivated by a desire to help people. I’m a planner because I want to be able to provide my clients with holistic advice that allows them to feel more positive about their future and not have to worry about running out of money. Being the person that helps others identify, create and maintain a better life for themselves and the people they care about the most. To help people improve their life and let them focus on what is important to them by helping them manage their finances. To not only put a solid, sound financial plan together for clients but help those clients stick with the plan. As Warren Buffett noted once, it\’s sticking with the plan that most clients have difficulty with. To help people and their families identify dreams and then work with them financially, ticking them off along the way. What motivates me everyday as a financial planner is the zeal to help my clients become financially secure through directing them to the path that can make them achieve that security . Naturally people become happier and more motivated when the future can be predicted rather than following it blindly with no clear cut goals to achieve. Western government needs financial planning to work, otherwise governments will go broke i.e. Greece. The opportunity is huge those who are effective communicators. Ultimately it is about making the world a better place for the masses. The challenge to help each client, with their varying views and goals, rediscover what and who is important to them. Then to see them take steps to protect themselves and these individuals so that they can spend the majority of their time and energy on things other than finance. Since financial literacy is extremely low amongst general public, it would be satisfying to see friends and clients to enjoy life than facing financial misery. When people say, you make is sound so simple, I finally understand. To bring to people a better way to invest. Ronald – as always a very good article. I read the book \”Switch…\” by myself and it is great. My Motivation?`To help people through the fog ,generated by the financial industry, to get a clear vision of ther needs. I like good people and not everyone I meet I feel is good. I end up not taking as clients many people I see. I pick and choose who is best for me, and who is best for me, I am best for them. We pick each other. I like the process of ferreting out those genuine sincere people and building a relationship. A genuine desire to help people live life on their terms. To see excitement and confidence in clients faces where there used to be confusion, fear, and uncertainty. What motivates me? To provide clients with clarity of mind, empower them to walk their walk and live without worry and fear. I enjoy financial matters and get personal satisfaction and financial reward from helping people clarify their issues and lifestyle goals (the dream) and then take some actions to have a good shot at achieving the dream. To walk with my clients & guide them on their financial life needs. I never wanted to be a financial planner, my first love is food, preparing, cooking and sharing it with friends and family. To help people have their money work for them rather than working for their money – which provides the emotional empowerment to focus on living their real values. I am a financial planner because I know that when you\’re set up well financially, you feel more free, more powerful, more positive and more able to live a life filled with joy. You have less worry and more peace. I want my clients to feel that way, too. I became a Financial Planner in order to help people in their journey of life. To help rearrange their finances to enable them to get them where they want to be. The saying goes, \”The purpose of life is a life with purpose.\” Contributing to families, through giving them the support and guidance they need on the issues that matter to them, achieves the goal every financial planner should have. I want to be seen as a catalyst for change thus commanding respect. George Kinder calls it \’lighting the torch\’, creating an emotional vision of the future our clients are motivated to live into, to live a fulfilled life. By becoming so motivated the inevitable obstacles are easier to deal with. The financial plans become a tool to achieve the vision. Witnessing change in my client\’s lifestyles! The joy of influencing peoples life\’s in a positive way. To meet and help people with actual issues – work with them and not in the confines of a corporate structure. My main motivator using the Motivational Maps analysis is \”Searcher\” (see http://www.motivationalmomentum.co.uk for further explanation). I want to see my work as important and significant, to make a difference and I believe the role of a Financial Planner does exactly that. Helping people to choose the life that is most useful, and habit will make them more pleasant. My goal as a financial planner is to assist clients to end up in a better financial position than they otherwise would have been – through education and strategies to protect and grow wealth. Hi Ron, great article. What motivates me? Like one of the answers above from Nicholas (wow amazing video wow), you can hear this on my video on the front page of my website. In a sentence – to lighten the load for my clients. To allow clients to live without worry and fear. In essence, with confidence that all that matters to them is attainable. This may sound a bit selfish, but I love the \”buzz\” I get when one of my clients achieves their goals, or \”just gets it\” when discovering how financial planning can help reduce their worry, push them to achieve, etc. I\’m a planner because I want to be able to provide my clients with planning advice that allows them to feel secure with their future so that they can concentrate on the things that are truly important to them. Assisting people to have peace of mind over their financial circumstances. Getting clients to the point where they truly believe they have the right to achieve what they want. I do it to take away my clients worries. (I am a risk advisor predominantly). I take away worries about how their families will survive financially, or how they will afford medical treatment, or indeed how the mortgage gets paid. I\’m a financial adviser and everything I do is to help people protect and provide for those they love. That\’s why they call me the \’protect and provide guy\’ and that\’s why I only work with people who have that as their key goal. Seeing the impact both of poor and great advice and how it can change a clients confidence financially in this world. their a few things more rewarding than seeing a persons physiology change and notice how they are feeling and having improved strength and self belief as a result of what they thought was going to be a meeting with some insurance adviser that only wants to sell them something they dont want. I am motivated to improve peoples lives. We seek to remove the burden of family wealth management for successful families by helping them manage the complexity of managing family wealth in today\’s increasingly complex world. In this, we hope to improve the quality of financial products and services they receive while significantly reducing the amount of time and money they spend managing family wealth so they can spend more time growing or managing their business or enjoying their success. What motivates me is the belief that I am improving my and my client\’s life, my community and the world by helping them use their financial resources to fund what matters to them most. Please watch the video on the front of my website. It last for about three minutes and explains why I am a financial planner. Nail on the head Daryl. To better myself by helping clients to better themselves (& their associated financial well-being).